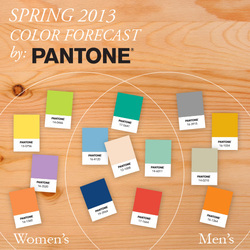 The fashion news you've been waiting for is finally here: Pantone just released their color forecast for spring 2013, which means you can now pick on-trend shades for your promotional products and logoed apparel. Pantone's 2013 palette "mixes dynamic brights with novel neutrals to create a harmonious balance," and includes hues of jade, violet, poppy and beige. Out of all of the featured colors, green is the most prevalent. Will a shade of viridian or lime replace tangerine tango to become the color of the year? We'll have to wait and see! Stay tuned to our blog, call your account executive or contact us to see examples of how the 2013 color forecast will appear in next year's promotional products and apparel!